...Cunningly disguised as a hair brush this time is a compact bug detector that was hidden in the wash bag. 007 must get an upgrade with each mission. However, this one isn’t any old Bug Detector, it also has an in-built Morse Code Telegraph machine. Technical Surveillance Counter Measures - Electronic Counter Surveillance is another technical description. To most of us, the phrase would be Bug Detection. Internet Security: The Real Bug Detection - Admittedly, few of us will experience the need to scan our hotel room for bugs, but a very serious threat to all of our security is of course internet hackers, spammers and hackers. 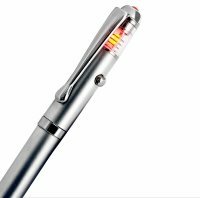 With a professional RF design, this covert detecting pen will give you 24 hours a day privacy protection from audio transmitting bugs, wherever you happen to be. Very portable, this pen not only will detect transmitting signals from audio spy bugs and mobiles, but is actually a working pen you can write with.